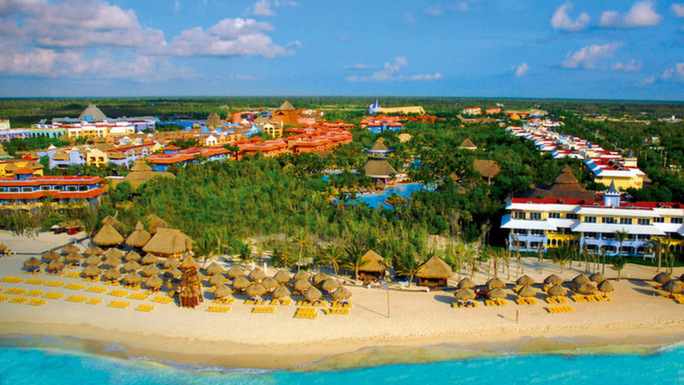 On a sparkling, white sand beach on the Riviera Maya, just 30 minutes from the Cancun airport rests one of the top all inclusive resorts, the Iberostar Paraiso Beach Resort, and the vacation of a lifetime! This family friendly, beach-front, little slice of heaven offers some of the most incredible vacation packages in all of Mexico. The Iberostar Paraiso Beach Resort has 432 spacious rooms, from the elite presidential suites to the standard family deluxe rooms, you’ll find an accommodation that fits your group or family during your trip to Riviera Maya, Mexico. Playa Paraiso, meaning, Paradise Beach, will bring a smile to your face, for this beach is everything you want in a Mexican vacation. Conveniently located only 20-30 minutes away from the Dreams Riviera Cancun, your location is preferred and easy to navigate around. 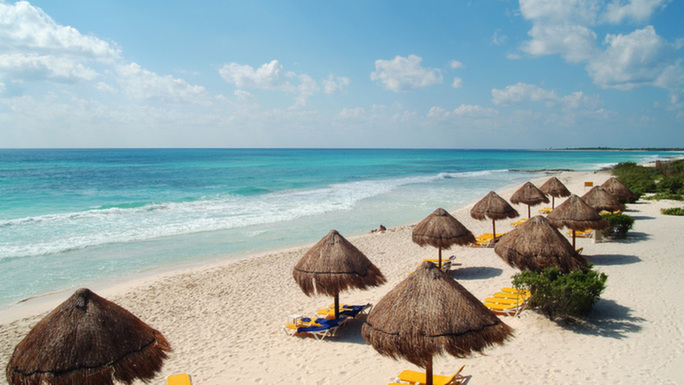 Iberostar Paraiso Beach is located between Cancun and Playa del Carmen, so it’s very easy to move from beach to beach, but we expect once you arrive here, you won’t ever want to leave. That’s one of the best parts of an all inclusive vacation, then fact you never have to leave. Meals are always prepared on time, cocktails are always ice cold, and the pool is always awaiting your arrival. Once you pay the initial package cost, you won’t have to carry your wallet around, because everything is already covered! All you need is the swim trunks, your favorite Hawaiian shirt, and an open hand to hold your Margarita. Iberostar Paraiso Beach Group Rates are very affordable and allow guests to enjoy their dream vacation with all types of group sizes. We make it easy to book a beach resort package without having to deal with dozens of different operators, so planning a large group vacation is very easy. 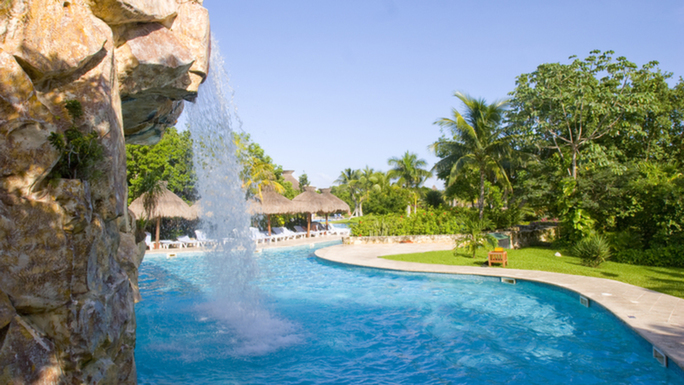 One of the most important parts about a vacation to Mexico is the resort, and we want to assure you that this resort is everything it’s cracked up to be. Just check out some of our Iberostar Paraiso Beach photos, they will astound you! The Iberostar Paraiso Beach Resort has one of the largest pools in the Riviera Maya, allowing guests to enjoy a pool that is never overcrowded. You’ll be able to organize group pool volleyball games with your friends, or make reservations at the most luxurious restaurant at the resort without having to pay a hefty reservation fee. Vacationing with a group is always more fun that going alone, that’s why the Iberostar Paraiso Beach group rates have been recognized as some of the most affordable and organized in the country. The unique part of Iberostar Paraiso Beach is the natural setting the resorts rests upon. Due to it’s close proximity to several nearby eco-parks. The landscape is full of swans, peacocks, flamingos, lizards, coatis, ducks, and much more local wildlife. In addition to the presence of dozens of different animals, the Iberostar also provides unforgettable views of some of the Riviera Maya’s natural features. The bustling and lively atmosphere of the Iberostar has allowed it to become one of the most family oriented and luxurious resort accommodations in all of Mexico, which allows guests traveling with young children to rest easy as they vacation in Mexico. 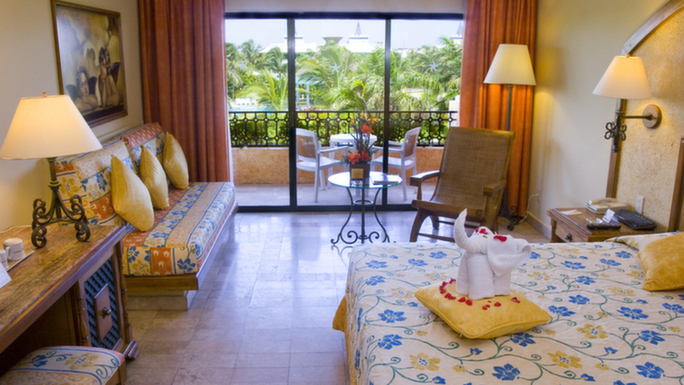 As one of the top all inclusive resorts in the Riviera Maya, you will find your happy place here at Iberostar! When you choose Iberostar Paraiso Beach Resort, you get seven à la carte restaurants, plus two buffets with the all-inclusive package. Though the majority of the restaurants take walk in reservation and there are two all you can eat buffets, a few of the more luxurious restaurants prefer if you make a reservation before you dine. 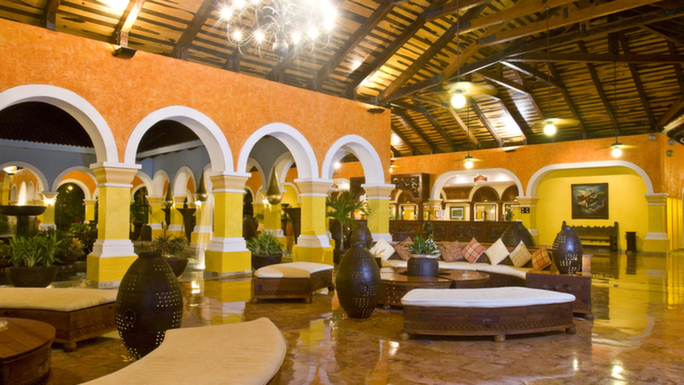 The Iberostar Paraiso Beach in Riviera Maya excels at treating its guests to cuisine from around the world, literally. You can enjoy a fresh Paella from the beachside restaurant, a Mediterranean meal at La Dorada, a hibachi style dinner at Japonez, an unforgettable Mexican meal at La Hacienda, or a traditional Italian meal at Don Alfredo, but the choice is all yours! Iberostar Paraiso wants to make sure you have enough options to keep you completely satisfied during your stay, so they have chosen only the best chefs in the word to cook for you. Whether you just want to grab a quick bite to eat at the poolside bar, want to pig out at the all you can eat buffet, or if you’d like to enjoy a nice candlelight dinner with the love of your life, you’ll find you have plenty of options when you stay at Iberostar Paraiso. This resort definitely does not lack daytime and nighttime activities for both adults and children. Kids will be occupied for hours at the Kid’s Club, which offers sport games and other kid friendly activities (ages four to twelve). Also, there’s a teenage disco club, which keeps the teens dancing and having the time of their life (open until 11 p.m.). And Obviously, enough bars and adult entertainment to keep you and your friends up until the wee hours of the night! With incredibly spacious rooms, delectable cuisine, and enough entertainment, and activities to keep everyone happy during their vacation to Iberostar Paraiso Beach, you’ll remember why you chose this resort for your vacation to Mexico. The pool is refreshing, the sun is always shining, and the Piña Coladas are always frosty cold, this place is just about as close to heaven as you’ll be able to find. Iberostar Paraiso Beach group rates are affordable and allow you to enjoy a vacation with large groups, so there is really no reason to hesitate any longer. Book your family’s next trip to Mexico today!